I did some casual Sunday afternoon shopping today, and of course with it being summer and all I found myself naturally drawn to the maxi dresses and skirts. So many colors, prints, cuts, and even some daring pieces that were backless all had me drooling for a shopping spree. I picked up a few of my favorites and headed to the dressing room, hoping to come out with at least one piece that I really adored. However, once again I was let down by the maxi world. 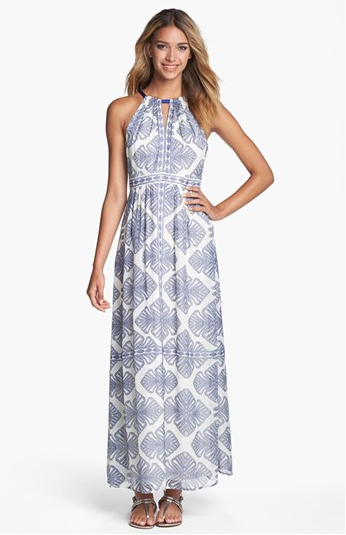 Maxi dresses, like the gorgeous Vince Camuto maxi dress below, never look good on me! I am not short, so the length isn’t a deterrent like it is for some women. It is the way the maxi dresses fall on me. For anyone with wide hips, a bigger backside, or thick and/or muscular thighs, maxi dresses just highlight all. the wrong. features. Today I felt like a pregnant beluga whale while trying on 5 or 6 maxi dresses, although I know that I’m far from an orca or any other large mammal for that matter. The feel of the maxi dresses themselves I love; they are so light and comfortable and I LOVE that in nice clothing. And I really like the way maxi dresses look on many other women, just not myself. The polyester and jersey materials do nothing for my body, and it is quite frustrating that even though I’m by no means huge as a size 6/8, I look so dreadful in such an easygoing summer look that so many others pull off effortlessly. My current opinion is that I think maxi dresses and skirts might just be a style that slender girls can wear. Because while I am by no means fat, maxi dresses definitely make my curves feel like a bad thing. And there’s nothing wrong with that, I see girls rocking maxis every day and I admire how thin and effortlessly chic they look. While I don’t have the same problem, I do have a suggestion! Buy a size up, so the fabric is more drape-y, and then belt. You’ll get a little extra room and swing in the dress itself. Hope this helps!